With a set of drum sticks and his 8 mm color home movie camera, Mickey Jones toured the world in 1966 with Bob Dylan and The Band. He captured on film what became known as "the tour that changed Rock and Roll forever." The booing crowds, the scathing reviews, the stomping feet, the infamous cry of "Judas!" ... all of this in response to Dylan trading in his acoustic fork guitar for a hard edged, electric sound. The Royal Albert Hall CD, Live 1966, remains the only commercial release from the 1966 Bob Dylan World Tour. Now, for the first time ON home video, musician turned actor Mickey Jones (Sling Blade, Home Improvement) chronicles the legendary 1966 Bob Dylan World Tour through his recently discovered films. Almost 40 years after the fact, only a limited number of folks remember the impact Bob Dylan had on the music scene when he “went electric”. Dylan first gained fame and prominence as arguably the most eloquent and skilled folk music performer and writer, and his talent with words led rock songs by other artists to become less about love and romance and more about social commentary and world issues. In 1965, Dylan began to incorporate electric instruments into his music, and the folkie die-hards responded poorly. The furor didn’t dispel quickly, and – as depicted in the famous documentary Don’t Look Back - Dylan got nasty reactions from partisans most places he went for quite some time after that. Don’t Look Back will always remain the most significant document of this era, but we now have another look at this period in Dylan’s career. In World Tour 1966 – The Home Movies, we get a glimpse of the era from the inside. Filmed by Mickey Jones, Dylan’s drummer at the time, the program offers a different take on the experience. At the start of Movies, Jones sits for an interview and tells us about his early interest in music and his career. We learn how Jones got into the field and hear of his various jobs up until he hooked up with Dylan in 1966. Jones then discusses rehearsals and his early experiences with the band. After about 28 minutes of this, we finally see some of the 8mm “home movies” shot with Jones’ camera. These start with the opening of the tour in Hawaii and then proceed through Australia, continental Europe, the UK, and back to the continent. 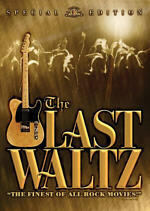 The band then returns to the US, where Dylan has his catastrophic motorcycle accident and Jones’ time with Bob ends. As we watch the footage, Jones narrates and gives us information about the tour, his experiences, and other insights. When the footage finishes, Jones provides his thoughts on Dylan and his experiences since 1966. Frankly, Movies feels a bit like a tease. The program promises insightful glimpses behind the scenes and an insider’s feel of this legendary tour. We don’t get that. Instead, Movies comes across as a fairly bland travelogue. Much of the problem stems from the absence of sound for any of the footage. We hear Dylan music throughout the program, but this comes from new versions performed by a cover band. Apparently the only audio from any of the shows comes with the infamous “Judas!” remark at the Manchester concert. This accompanies no footage, though, and is just an audio excerpt without any actual Dylan music. We get some mumblings from Bob but no songs. The DVD attempts to fake us out at times. Sometimes we’ll see performance footage accompanied by Dylan songs, and the degraded quality of the music might lead us to believe that we’re hearing actual audio from the shows. This isn’t true. The songs don’t match the playing at all and clearly aren’t really Dylan. Really, the footage itself is the least interesting part of this program. We see lots of shots from the road – literally. Jones films the gang as they hit tourist spots and hotels. Occasional shots from the stage also appear, but without audio, this feels pretty useless. Very little genuinely compelling footage shows up here, as most of it seems bland and pedestrian. A very chatty man, Jones offers some good comments, though the show could use some judicious editing. Jones provides a number of useful notes about the music and the shows. He goes into alterations made to song arrangements and the ins and outs of some performances. However, we hear way too much about their tourist activities. We don’t see a lot of Dylan on those occasions, and this starts to feel like The Mickey Jones Show. Actually, the drummer remains the solid focus of the program, as it becomes much more about his life and career than that of Dylan. When Jones focuses on the music and the performances, Home Movies presents intriguing material. Unfortunately, the program strays from that realm much too frequently and concentrates too much on travel and not enough on music. Movies often feels like we get little more than a session with a long-winded uncle and his vacation movies. 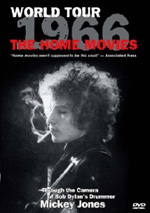 Bob Dylan: World Tour 1966 – The Home Movies appears in an aspect ratio of 1.33:1 on this single-sided, single-layered DVD; due to those dimensions, the image has not been enhanced for 16X9 televisions. The program mixed two sources, with varying results. Not surprisingly, the 8mm footage from the Sixties looked terrible. Sharpness was poor, as the shots consistently seemed soft and fuzzy. They rarely appeared well focused and were rough and ill defined. Grain dominated, along with a mix of specks and marks. I must note that source flaws were pretty minor for this sort of material, though, and they caused the least of the problems. Colors looked heavy and messy, with dense tones that appeared thick and muddy. Blacks were inky and flat, and low-light shots seemed dense and tough to penetrate. None of this shocked me, but I needed to mention it anyway; the archival footage showed its age and source. The other half of the program featured modern interview segments with Mickey Jones, and those looked just fine. They displayed good clarity and sharpness, with no instances of softness or fuzziness. Source flaws seemed absent, and the muted colors looked accurate and clean. Blacks were also tight and deep. All told, the image seemed about what one might expect, so it earned a “C”. The Dolby Digital 5.1 soundtrack of Home Movies seemed unassuming to the extreme. Actually, this appeared to be a two-channel stereo mix, as the front center and the rear speakers played literally no role in the presentation. Speech dominated the program and appeared somewhat ill defined. Jones’ narration came from the front side speakers, which left it without great localization in the center. Otherwise, we only heard the background music played by the Dylan cover band. This showed minor stereo imaging but played a small role. Quality appeared adequate. The two-channel presentation of the speech made it sound a little raspy, but overall, the dialogue came across as natural and distinctive. Music was too quiet to give us much of an impression. The songs sounded decent but no better than that. Virtually no effects elements appeared. The audio came across as serviceable but not anything more than that. Only one supplement appears on Home Movies. We get a picture gallery. This includes 82 images. Most are candid photos, but we also find some interesting materials like Jones’ signed photo of the Beatles. It’s a decent little collection. On the surface, Bob Dylan: World Tour 1966 – The Home Movies sounds like a fascinating piece of work, as it promises long-lost behind the scenes footage from one of rock’s most significant tours. Unfortunately, we see little of interest, and though drummer Mickey Jones presents some interesting insights, he often discusses dull topics that don’t relate much useful material. The program looks fine for what it is, and the audio seems acceptable though no better. The DVD includes almost no extras. Leave this historical curiosity for the Dylan die-hards, as I can’t imagine it’ll provide much of interest to others.